Depends how fast you are going :-) I will admit to getting too focused on my line at times. It can be enjoyable to back off the pace a little bit and take in the sights from time to time. I suggest you look at the beautiful view on your left and catch the road with your peripheral vision ;0). Yeah if I'm not in a hurry to get anywhere on a trip, I'll ride the road twice. Once to see the sights, and familiarize myself with the curves. The second time, at a more heated pace. For me, about 90% focus on the road ALL THE TIME. If the view is good ... PULL OVER and get out the camera. Take a break, take it all in. Relax. 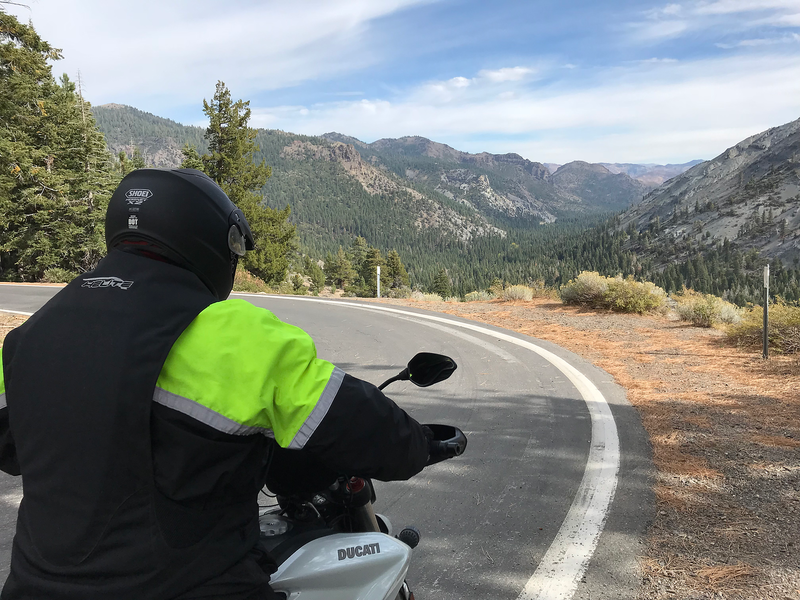 My riding group repeats routes year after year, we have designated pull over stops for taking in the view, pee, water and Photos. These can be from 10 minutes to 20 minutes. Then, back on the road with a vengeance and 100% concentration on the road. Certain roads allow you to relax a bit ... if boring straight sections. But if your averaging 100 mph on those sections, then I'd advise 100% concentration on the road ahead. Biggest modern day distraction lately are guys trying to read their GPS and ride at the same time. TWICE we've had guys go off the road. Luckily neither guy went down but way too close for comfort. GPS is as bad or worse as Texting. And we all know what that gets you. Lake Tahoe distractions ... eyes front! On the way to Death Valley ... this bit is WAY steeper than it looks. Knobbies please! Last edited by Hyp Noob; March 18th, 2018 at 11:35 AM.